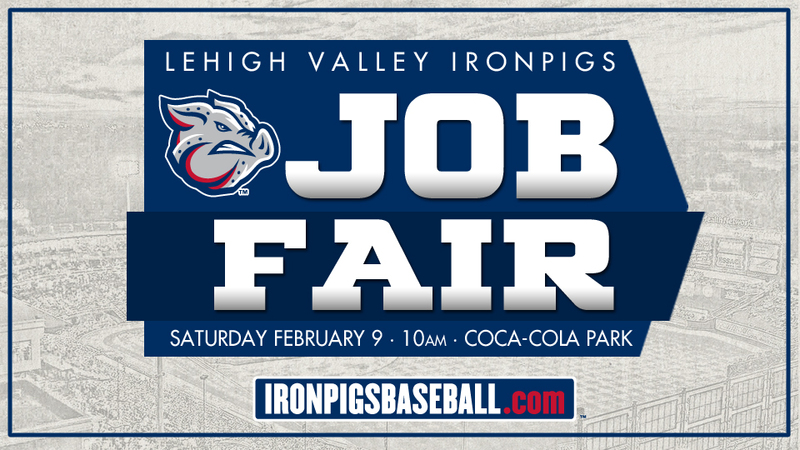 Visit Coca-Cola Park's PNC Club level Saturday, Feb. 9 starting at 10 a.m. for the IronPigs' 2019 Job Fair. That morning, the team will conduct open interviews for more than 400 gameday positions. IronPigs staff members will be on hand to meet with interested candidates and discuss available opportunities via open interviews. Attendees are encouraged to print out the gameday employment application and bring it to the event. These jobs are all paid and include the opportunity to work many of the team's 70 home games and other special events between April and September. "We pride ourselves on providing the best guest experience in all of Minor League Baseball," said IronPigs President and General Manager Kurt Landes. "These interviews provide individuals an opportunity to join the IronPigs family, help us serve our fans and make some additional money during the summer months." Those selected for positions will enjoy flexible scheduling, bonus opportunities, IronPigs merchandise discounts and access to exclusive employee events during the season. Attendees are asked to complete the IronPigs employment application in advance and have it available during the event. The 2019 IronPigs baseball season is presented by Capital BlueCross.